I mentioned I'm the mother of three children, ages 8,5, and 2. Needless to say they keep me running around. I'm always amazed by how active they are throughout the day, and also how quickly they can hit the wall, and complain of tired feet. Do you know what I've learned? The shoes that I have bought my children don't always provide all the cushioning and support they need. I've tried everything from $15 shoes from the box-retailers to $65 shoes from the latest and greatest European designers. What I've found is that even the most well-made shoes don't have adequate support in the arch - and that's why children's feet get sore and tired faster than ours! There are a few good shoes for children that I've found give the best arch support - Merrills come to mind here. But, as we all know, many times styles dictate what our children wear, not function. So, how do you balance the need to give your kids' feet good support and comfort with the desire to get those cute shoes they love? In a nutshell, Arch Angels. With Arch Angels, you can put our comfort insole in any closed shoe, and move it around from shoe to shoe. If you're anything like me, your kids have 3 or more different pairs of shoes at a time. You can use Arch Angels in all of them, and be assured their growing arches are getting the support they need on the inside while they wear the cool shoes they love on the outside. Welcome! 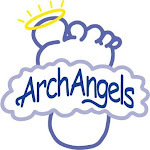 This is the inagural post for our new blog about Arch Angels(tm) and how to have healthy kids' feet. We are launching our product in November, and we are excited to put it in the shoes of kids everywhere so that they can benefit from the comfort and support of an insole that is designed for kids. We've been working on this product for more than five years, and we are so excited to finally share it with the rest of the world! I want to use this blog to share with you all the amazing things I've learned about kids' feet along the way and how, as parents, we have the opportunity of making sure our children are stepping out with their best foot forward into their action-packed lives. Stay tuned and let's share with each other the amazing things our kids do with their feet!
. : Mommy Doodles : Blog :.